Summer is coming, and lately we’ve been getting a few rare “teaser” days of warm weather here. Miles loves being outside, but overheats very easily. Since dogs are more sensitive to heat than humans, I can’t blame Miles for being careful when the temperature rises (excellent article here). I am excited to show off a cool new piece of gear for deck-lounging and outdoor adventures… The Shade Shelter! I am signing Miles and I up for our first outdoor agility show this summer. For that event and for our many other warm-weather adventures this summer, a spot of portable and dedicated dog shade is really going to be appreciated by Miles. Folded up the Shade Shelter is about the size of a rolled up umbrella. Set up it can comfortably fit both me and Miles, or most sizes of dog crates and a cooler. 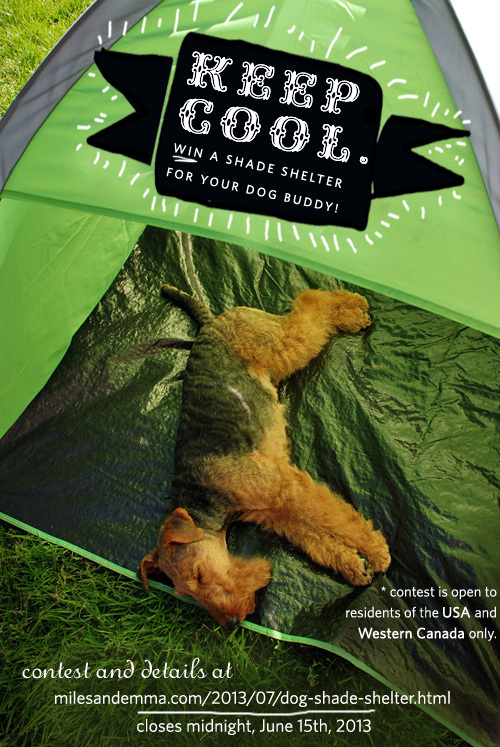 If you live in the USA or Western Canada, and comment on this post before June 15th to tell us what kind of outdoor activities you and your pooch are looking forward to doing this summer, you will be automatically entered in a random drawing for a Shade Shelter. Make sure to check back on June 16th to see if you are the winner. Good luck! * Contest is only open to residents of the USA and Western Canada. Contest closes at midnight (PST) on June 15th, 2013. Winner will be selected at random, and announced at the bottom of the comments the following day, on June 16th, 2013. My pups and I will be swimming, walking, relaxing in the yard and cuddling with the new baby (their favorite) 😉 the shade shelter its perfect for us! My dog Chester likes to follow me around the yard when I am gardening… He'd like to be right beside me all the while, but he does't like to lay in the sun when it is warm. The "Shade Shelter" would be so perfect for Chester! I could just move it around the yard as I worked and he'd always stay cool in the shade! Nice. My Boxer Recchi and I love going for hikes, playing fetch and wading into the lake! He also loves going outside to play with his doggie friends and to chase bugs. This would be perfect for my brachycephalic buddy and I so we could cool off after playing. My Sheltie Dream and I will be doing some herding and agility this summer and could certainly use this wonderful product! I take my 2 dogs to a dog beach and one of these would be great for them to have some shade and something to lay on. We probably would have a "visitor" dog or two who wants shade too! My friend E and her dog M are coming down to my wedding, perhaps they can bring their awesome shade shelter to show off!! Artie and I will be hiking, swimming and attending dog events. Last weekend we went to a fundraiser at the Lions club. Artie won the best tail wagger contest. Our Welsh, Bailey loves swimming in the pool, playing catch with her Planet Earth ball, and a good game tug with her tug toys! Gryffin, my husband and I are moving to wine country to a house with a huge back yard! However, it's super hot compared to the city (SF) and Gryff is def in for a change. We are worried his thick welshie coat will be hot in the 90+ temps, so this would be a great help. Congratulations to Debbie Stewart and Dream! You were randomly selected as the winners of the Shade Shelter! Please email me with your info and we'll get your prize to you asap. Thank you everyone else for entering! I really enjoyed reading all of your summer plans. Stay tuned for more giveaways — hopefully another handy summer one. Ashley, your baby is gorgeous. No wonder the dogs love their sibling! Darcy, how is Mr. Chester these days? Does he ever dig when you are in the garden? Debbie, congratulations again, and please, do send us some pictures of you and Dream using your new shelter at this summers events! Juanita, how lucky are your dogs to get to go to the beach often in the summer. Do they swim too? Aimee, so Baloo hangs out below while you rock climb? I am really, really curious after reading your comment!! Anonymous, Sounds like your friend E and her dog M will have a great time at your wedding. Something tells me you don't need a shade shelter, given all of the fancy summer fashions that will be on display. I heard two guys were dressing up AS a shade shelter! cstironkat, Sounds like your summer is all planned out with lots of fun dog-related activitities… And how freakin' cute taht Artie is a champion tail-wagger. I'd love to see a picture of him winning that award! Gail, Bailey sounds like one well-cared for Welsh, with all of her great toys and high quality food. What part of the earth are you guys located, if you don't mind me asking? *E, How fantastic to move to wine country with space to move around. I agree — Welshies aren't crazy about heat…! What sort of strategies do you have to keep him cool? Stay tuned, I am sharing a cool-off recipe that has really helped Miles during hot times. Hey Aimee. Boulder, what a great place to live. I am from Oregon, but I never got into rock climbing. I am completely ignorant about it. If you have any pictures of your experiences I'd love to check them out and see if I could do a post about you guys! Maybe you can share your knowledge to let others know how to enjoy such an activity with their dogs. Myself included! Emma, we take advice from you with all the tug toys and agility fun. As for finding just the right food for our Welsh we rely on dogfoodadvisor.com – a tremendous source for every dog owner. We are Massachusetts natives who winter with our Welsh (and Canadian friends!) in Palm Desert CA!